Jos Thoné is the Comeback Kid of pigeon racing: he sold his entire pigeon collection in late 2010, after which he quickly regained his position as a national champion. Jos is now planning to make another fresh start, since he will be selling his entire old birds’ collection in late March. Download his catalogue to find out more about these old birds! After selling his entire pigeon collection Jos steadily worked his way back to the top. In 2011 he was still in the process of rebuilding his pigeon breed; in 2012 he already won a national first prize. Jos continued to add provincial and zonal victories to his palmares in the following seasons, and he became 1st General Provincial Champion of Limburg 2014 and 2nd General National Champion of Belgium, nearly finishing in first place. It was an impressive season for him that resulted in an even more impressive list of achievements. Jos decided to take a different direction after another great season. His collection of old birds will be sold between Easter Monday and Sunday 10th of April. This is the perfect opportunity to add a world class pigeon to your collection. 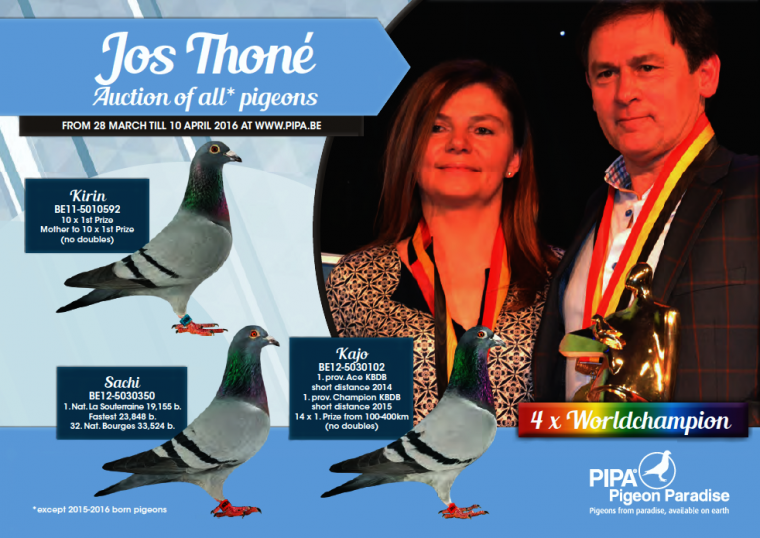 Click here to download the auction catalogue of Jos Thoné and discover the pigeons offered for sale. Would you prefer a printed copy rather than a digital version? We will send you a printed copy for just five euros (shipping included)! Click here to order a copy; the payment details will be sent to you right away. We hope you enjoy the catalogue!